A little less than a year ago I wrote a blog post about how I was stepping back from Fort Worth Writer’s Boot Camp and not growing the business. Due to some misunderstanding (which makes me wonder sometimes if I am really a clear writer or if there is just not clear reading being done) I suffered a bit of unnecessary backlash from it. Afterward, as I cleaned up various messes due to the misunderstanding, I decided that I needed to have a clear mission for the Boot Camp. I began to research and found that the true way to go with my writing workshops would be online. After much time spent researching, planning, outlining, delaying because of nervousness, scared because of the unknown, and worried about putting myself out there publicly even more, I decided to use Udemy as my platform for my classes. Last month I began having a good, old fashioned debate with myself about continuing to use my business name because I wasn’t sure if re-branding would be the way to go. After all, I had been Fort Worth Writer’s Boot Camp for four years. I had over 1,150 people on Facebook following the page. I still had over 500 pens and notepads with the logo on them! The most important part of this equation was the key word: I. Fort Worth Writer’s Boot Camp was me. I had a handful of writers work with me, teaching workshops from poetry to screenwriting, but when it came down to it, every time I taught a class, my class sold out. I began coaching and now have half a dozen writers that I mentor on a regular basis. Why did I want to keep a name that may not make much sense if I decide to move? So, the decision was made. 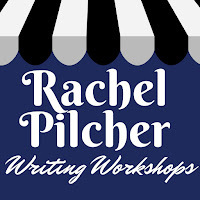 The transition to Rachel Pilcher WritingWorkshops became complete last Friday (Check the link above). I am so relieved to have made this choice, but it does come with downsides. Unfortunately, placing my name on the business does draw attention to me, whether I want it or not. Sometimes it’s negative, or sometimes it’s just a bit too personal—like the influx of men who send me messages now with just the word “hey” on them. Um… yeah. Why use more than one word when you’re trying to get the attention of a writer? I would have to say that the positives are far outweighing any negatives which may come up. If all goes well, my first online class will be up and running by this Sunday! Exciting times! More to come soon.